The dock can be aligned to the left or to the right side of the screen. It also can be configured to autohide and to show thumbnails for all running windows or for minimized ones. Added option in extension preferences to enable/disable application title. Added option in extension preferences to enable/disable close button. Increased app icon and close button size. 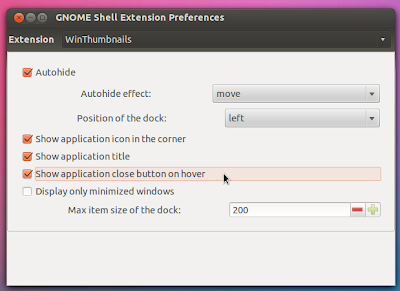 To install, extract the archive into ~/.local/share/gnome-shell/extensions/ and logout or restart Gnome Shell.